* Total number of reviews and star-ratings are based on data collected during the time period Blue Flame Heating, Air & Electric has been using the ReviewBuzz system and may not directly match the data found on each public review site. 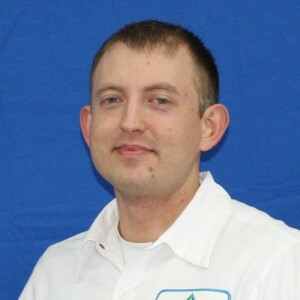 Darrin Beck was excellent in all respects: bid, electrical and installation of Whole House Fan and Bathroom Fans. On time, worked quickly and smoothly. Everything looks and works great. Thanks very much! After 16 years in my house decided to go for AC and I was very lucky that my neighbor recommended me Blue Flame. After 2 days of the initial home consultation they came and installed the AC. The crew that came to my house Ryan H, Ricardo and Cameron were extremely polite and professional. They made that everything was working perfectly before leaving. They did a great job. I recommend Blue Flame. Brandon came out, on time and with the work order to perform the first scheduled maintenance of our Mitsubishi Heat Pump, with recently installed Aprilaire humidifier. 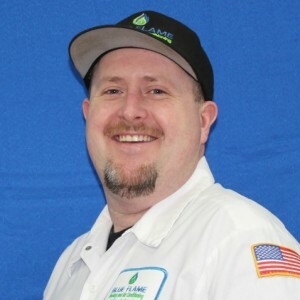 Brandon, an ex-Army mechanic new to the Blue Flame company, was polite, efficient, and organized, had not been made aware of the humidifier which needed specific maintenance. He got on the horn (I'm an old Vietnam Vet), figured out what he needed to know and proceeded to do the required maintenance. We had purchased the high-end Mitsubishi unit for our modest but well-built and -maintained NE Seattle residence to replace the natural gas furnace, and to have air conditioning for the increasingly warm summers. It is, like any emerging technology, subject to unexpected aberrations. Blue Flame has done a good, though not yet great, job of installing and servicing their Mitsubishi units. The people are excellent, responsible, with consistent customer service. They are dealing with a rapidly-changing home-energy technology that challenges the management and service capabilities of their staff. I would give the technicians 4 or 5 stars. Everything turned out very well! Thank you! This installation was very smooth and efficient! There were no problems and everything was thoroughly explained. I have already referred my son-in-law to your company as they are in need of a replacement furnace and possibly air conditioning. Thank you! Tobin was very professional and informative. Great job! Hired them for a heat pump checkup and cleaning. They did a great job. We had this Company come out to service/ maintenance on our heating system The young man Casey was very very personable knowledgeable and didn't try to sell us anything we talked about cooling systems and will definitely use this Company again! I have a Honeywell Electronic Air Purifier with reusable filters. I have not been good more recently about cleaning them often and apparently there's been some buildup of dust on my blower. It is fair to point out that the filters need to be cleaned and that it contributes to buildup that shortens the life of the furnace. However, when the technician cleaned everything, she must have used pressure against the filters when they weren't properly supported and severely bent them. She also washed the non-reusable filter and ruined them. She did not appear qualified to clean or comment on my equipment. To top it off, I felt criticized for choosing to Electronic Air Purifier/Filter in my furnace, and am extremely upset about bending/damaging my reusable filters. If I do need to replace my furnace I will not be using Blue Flame. Tobin was first rate. He carefully explained all that needed to be done and completed a thorough inspection of my furnace. He took the time to answer all my questions and said that I should feel free to contact him anytime I had anymore concerns. I wish he could be my technician every year for my maintenance call. Thank you Tobin!! Easy to get serviceman for maintenance check. Good communication with scheduler and dispatcher. Serviceman arrived on time even a few minutes early. Serviceman explained all that he checked for maintenance. He had to make a small repair and had the part in his vehicle so that he could take care of it in the same call. John was great. I would have him back anytime. The whole team from Blue Flame was terrific. The salesman was friendly, he listened to my needs and answered my questions, and was knowledgeable about the entire system--another company put the air conditioner in improperly. They were the 2nd lowest bid, but I went with them because I had more confidence in the company. Communication with the office was a breeze. Luis and his installation team were on time, polite, kept me informed, walked me through the changes, and cleaned everything up before leaving. They corrected the error made by the ac company and ensured that the whole system is up to code. It's obvious that the company strives to provide good customer service. Al was here with Ali who was a trainee and both were excellent, communicated what they were doing for my annual maintenance and Al was even nice to move a heavy umbrella stand off my deck for me. Great guys to do business with. We received outstanding service, from our first meeting with Michael C. to the expert installation of our new furnace and water heater by Shawn and Gabe. We couldn't be happier with our new furnace and HW heater! Michael understood our needs and conveyed them perfectly to the Install team who came out just 3 days later. Totally pleasant experience. I will be recommending Blue Flame to all! Thank you, team. Customer service is always a top priority at Blue Flame Heating, Air & Electric. Our BBB Membership A rating is like a badge of honor as we continuously strive to provide the best experience for our clients. 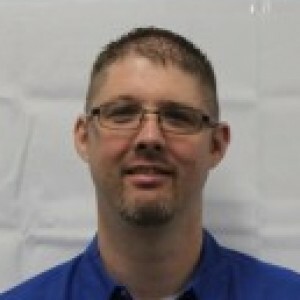 Brian L has a 5-Star rating and leads the company in total reviews, making this pro a ReviewBuzz Rockstar! I collected estimates from 4 contractors. Blue Flame was not the lowest bid, but did have the best warranty and online reviews overall. Sales rep was thorough, not pushy, and helped me select equipment that offered the most efficiency for my budget. We settled on a 2 stage multi-speed furnace (American Standard Gold Furnace) paired with a 13 SEER 4 ton A/C. Our home did not previously have A/C so new electrical and refridgerant lines were needed. Kept my exisiting Nest thermostat. Blue Flame was able to install everything within 24 hours of signing the contract. The crew was very professional and courteous. I didn't find a single "mistake" - no holes drilled in the wrong place, no messed up paint, no missing caulk...everything looks great. Total cost after tax was $12K. Blue Flame installed a heat pump at my new home. I have a beautiful 24' solarium window in my kitchen that faces southwest and the house was running 15 degrees hotter than outside. It will be great passive solar in the winter but in July it was definitely an issue. I interviewed four companies before choosing Blue Flame. Their pricing was similar to the two of the other bids I got and seemed fair. 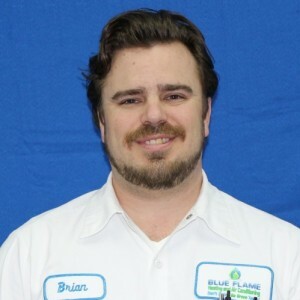 I liked Brian and liked how upfront he was with me about my options and how to best solve my cooling issue. He had a cancellation and was able to get me in very quickly which sealed the deal. Yesterday the installers, electrician and tech all came out and got my heat pump installed and running in one day. They were very professional, friendly and helpful. They started at 8am and the last two guys were here until 10pm making sure everything was working perfectly! Today it was 90 degrees out and I was able to bake cookies in my sunny kitchen without breaking a sweat. I love this heat pump and I am very happy with Blue Flame. Thank you! Blue Flame, Brian, our comfort advisor was very thorough at figuring out and explaining the system that was right for my home. His installation crew: Josh, Dane, Gabe, and Hunter showed up on schedule and got right down to business. They worked hard all day and finished the install. Kailana did a fabulous job coordinating everything and keeping the schedule on schedule. Blue Flame Heating and Air Conditioning recently installed a central air conditioning system in our home. From the start they were the most professional of the groups I asked to provide bids. They answered all my question, were very responsive and the installation team was impressive. They were very professional, worked very hard to get it all done and done right. Their inital bid was higher then their competition but when we discussed the issues they found a way to make their bid competitive. Its easy to recommend these folks to you for future work. On time and very detail oriented. everyone I dealt with was polite, professional and a pleasure to work with. I would highly recommend Blue Flame. Doug and his crew arrived on time, reviewed with me what they were going to do, and then got right to work. They worked quickly and quietly (just the usual drilling, hammering, etc). They treated my home with respect, cleaning up the work area when they got done. When the installation was finished, Doug showed me how to change the electronic air cleaner, how the thermostat works, and walked me through the paperwork that came with the installed equipment. I am very satisfied with the quality of the equipment and the installation work. We had a positive experience. Price was within our expectations. Job was completed as scheduled with no issues. Brian was a courteous friendly knowledgeable salesman. However I have yet to receive my deposit of $2280.23 back. It’s been almost a month. Let me know when I will receive it. Each one of the technicians who were on site for any portion of the AC and electrical install was superb! Great group of guys who were courteous, personable, efficient, hard working and extremely careful to keep my place clean while working. Also, the office staff was very friendly and helpful. The initial estimate encounter with Brian was informative and efficient. I especially want to thank Doug and Colin for a long day they spent working hard and kept a great attitude. From the Electricians to the AC Installers, they all were diligent in their work and very cautious as well. I look forward to my next job that I hire Blue Flame for. Felt like a slimey salesmen. Asked about the 'free' furnace offer on tv, called and acted like we would be getting the LAST deal. Will not do business with Blue Flame. But thanks for coming out. Initially had Blue Flame come out for a furnace inspection, everything for that went fine. Called for an estimate for furnace replacement and sales person came as scheduled...but never received a copy of the bid, the salesperson scribbled a few things on a piece of paper and said he would send a copy, also said it was only good for 3 days, which is totally unreasonable. Sales person said if the furnace went out they wouldn't be able to respond for at least a month. Kept talking about how good their service and quality were and how bad others was. I called a week later about the advertisement of a free furnace and the receptionist knew nothing about it, asked about not receiving a copy of the written bid and she said she would check into it, still have never received the bid. Terrible follow through. Not sure why I would ever call Blue Flame again. Very professional, answered all of my questions, didn't try to up sell me on items that I didn't need, and followed-up with me throughout the entire process. I've used them for two properties and are an easy recommendation for any of my friends that need HVAC work. Brian was able to give us a reasonable rate for new furnace, so was appreciated. The installation team did a great job, explaining all questions asked! Furnace is running quietly compared to the old one. I've already referred this company to friends, just hope their area is serviced by this company. Thanks again! Brian, Angel, Cameron, Tim, Kailana, and Kevin were a great team that sold and installed our new electric A/C system. Everyone was polite, knowledgeable, and friendly. The on-site team, led by Angel, worked hard for three full days installing our new system, and did a great job cleaning up when they were finished, which we appreciated. Later, Fernando came to install an air filter in our new system and also patch some holes left from the installation. He was prompt, polite, and efficient. No complaints here! Thank you, team! I recently had my oil furnace replaced with a high efficiency gas furnace. The installers were professional, knowledgable and friendly. They showed up when they said they would and completed when they said they would. I have no complaints about the installers. I did ask for an earthquake valve to be added on and was quoted $425 for that. I thought that was pretty steep given that I was already spending over $7,000 for the install. I've had a similar valve replaced on a different house for much cheaper than this valve's install cost. Blue Flame recently installed a new heat pump and furnace system in our home. They worked very hard, cleaned up everything when done and were courteous and professional. We did need another technician to come out the next day to set up the thermostat correctly. That only took a couple minutes and the system has worked great since then. My only comment is that after paying big bucks for the system, it seemed that we were charged an exorbitant amount for a simple (and rather flimsy) cover to keep leaves, tree debris, and rain out of the outside heat pump top. I don't object to it being extra, but I do think the price was crazzzzzy. I would use this company again but I would be careful about the "extras." We had just bought this home, which we love, but like everything, it did need some TLC. But we were thinking about having an A/C unit installed, so we thought we would get an estimate to see if it were something we could afford this year. 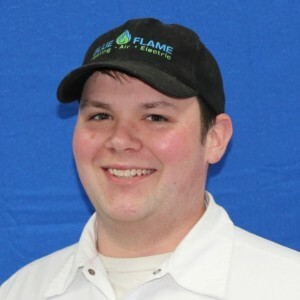 We know other people that used Blue Flame and were highly satisfied with their service, so we gave them a cal and Brian came out and worked up a estimate for us. The estimate was very good and included everything we would want, but we decided it was not in our budget this year but would work for spring time next year. 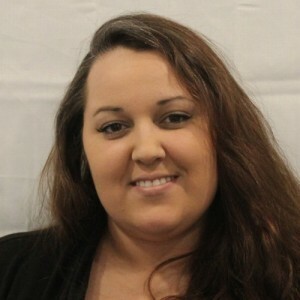 Everyone we dealt with was very professional and they will get the job when we are ready. Thanks to all of you. Darryl & Susan.